MONEY | What Is It? 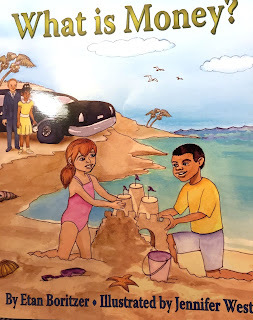 Published by Veronica Lane Books, 2014. On the third day of BookExpo America last week I met Etan Boritzer and got a copy of two of his books for children about economic topics. The first one I read is What is Money? - in its fourth printing by Veronica Lane Books. The concept of non-monetary transactions should be introduced right at the beginning of a discussion of the role of money in an economy. - Medium of exchange, i.e., an agreed-upon basis for buying and selling goods and services. - Unit of accounting, allowing all parties to keep track of the value of things and services, and track income and expenses, savings and investment. - Store of value, so that decisions to spend can be made sooner or later. Boritzer goes at the question in his book for children (K to 7th grade) a different way. He asks why we need money. He notes for the record that children "don't really need money" because their needs are largely taken care of by their parents. But children are commonly given an allowance to manage, they are given extra money from time to time, and they can also earn money. What I like about the book is that it discusses money in the broader context of social cooperation and service, keeping a place for unilateral non-monetary gifts of goods or services. When economists consider the alternative to non-monetary transactions, they talk about how difficult it is to barter because the seller of a chicken may not want, say, a basket of carrots. But there are other contexts in which the exchange is not a quid pro quo. Transfers of goods and services are routinely conducted between individuals on a voluntary and unilateral basis through convention, habit and altruism. Parents look after their children with nary a monetary transaction for many years. Barter is an imperfect method of arranging a transaction if it is intended to be immediate. If all you have is radishes to barter, you won't tempt me to trade my chicken for a year's supply of radishes. But a chicken could be exchanged for several weeks' worth of carrots, delivered weekly. Some of the work that kids do around the house is not paid, and some is. Some chores are a condition of getting an allowance, or is paid for on an hourly basis or by the task. People can reward you with other things than money, like a kind word or a smile. When you earn money, you can spend it on yourself, on something special to eat or drink. Or you can save it for the future. Or you can give it away. You can buy something for someone else. But money is not the only way that people can give things to their friends. A gift of time, a gift of flowers picked in the back yard, a gift of something that you have made. 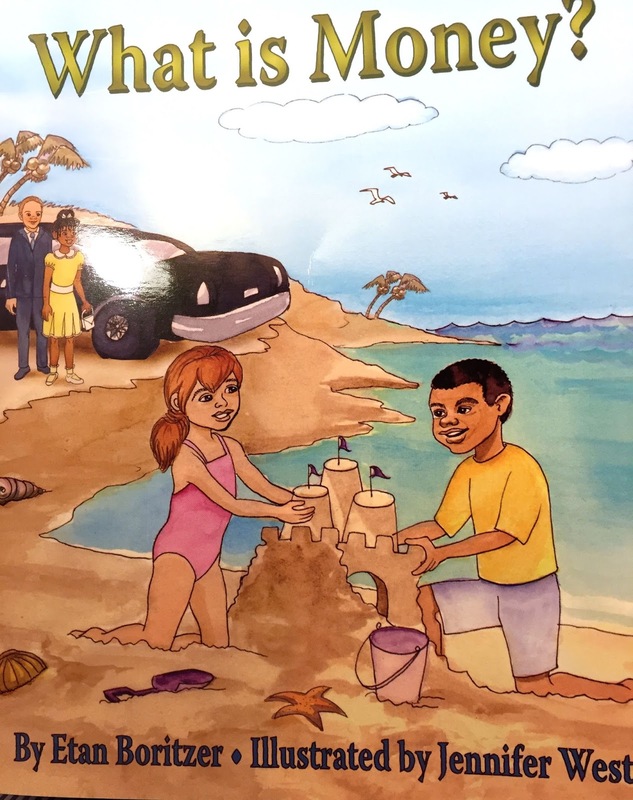 This book approaches money from a perspective that is more likely to make sense to a child than the typical introduction to money by academic writers. It makes a contribution by placing money in a larger context than is typically framed by economists. I just read an answer by Geoffrey Widdison on Quora on the question - What is money? I know exactly enough about money to be dangerous. Here's the thing about money: money isn't real. Economic growth, which is a very real and vital thing, works a lot like the fairies in Peter Pan, if we say we don't believe in it, it dies. To which I would add one comforting thought: Money in the United States is what the Federal Government says it is. FDR required individuals to sell their gold to the U.S. Government, then a few months later devalued the dollar against gold (i.e., raised the official price of gold). It helped get the United States out of the depths of the Great Depression. Now, dollars are the medium of exchange by law. The confidence issue relates to how the rest of the world views the dollar, and compared with what? Labels: #BEA15, Etan Boritzer, Non-monetary transactions, Veronica Lane Books, What Is Money? I spoke yesterday with a fellow blogger at BookExpo, the annual book show at the Javits Center in New York that winds up today. I asked him: "How are publishers addressing online competition?" He shook his head. "Nobody really knows what to do." Sentiment, however, widely favors the underdogs, the independent book stores like Books of Wonder. Some companies like Ingram are taking positive steps to grow their business by providing thoughtfully constructed services to the "indies" - independent publishers, authors and stores. Hachette's attempt to fight with Amazon over the pricing of digital books is well known. 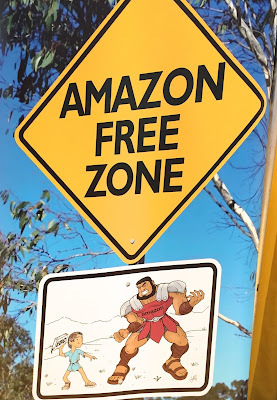 Amazon retaliated against Hachette by delaying shipments, ending preorders, and making it harder for Hachette titles to pop up as recommended to browsers. Writers have complained about Amazon's policies. Amazon has replied that cheaper books will benefit both readers and writers and - through higher sales - publishers. Meanwhile a smaller company than Hachette, Educational Development Corp. (EDC) in Tulsa, Okla., has taken a more dramatic step against discounting, as told by Aaron Gell in Business Insider last August. By no means the youthful David of the bible story, EDC's 72-year-old CEO, Randall White, in 2012 took all 2,000 of his book titles from Amazon - and other online discounters and big-box stores. He thereby gave up $2 million in annual sales . His problem was that while Amazon was selling more books, it was discounting them so much that revenues were declining. The outcome of his experiment is that EDC in 2014 had its best year ever in net revenues. EDC’s stockholders were worried, but since White personally owns 800,000 shares he had a ready answer to their beefs. The stock price (NADAQ: EDUC) fell as low as $2.50 under Amazon's discounting, and has since hit a peak of nearly $6 at the beginning of 2015. It fell back to $4 in April and in the last few days has recovered to $5. Mary Arnold Toys is one of more than 6,000 retail shops that carry EDC’s books. Many were distressed by the fact that sales were migrating online for the lower prices. The fact that EDC’s books could no longer be purchased on Amazon made it special for parents and their children to come into the toy shop. Sales of EDC books doubled. The company has Nancy Ann Wartman, in Taylor Mill, Ky., leading 7,000 home-based sales consultants who sell through book fairs and home parties. EDC's publishing division sells to children, who are spending their parents' money and are not very price-sensitive in their selection of books. They are more interested in inspecting the merchandise before purchase. A store where toys and books can be seen and handled is a real service for children and their parents. FDR's biggest challenge was at the Democratic Convention. Hoover campaigned in 1928 on the theme of prosperity, but in the next four years he saw this platform collapse under him. In fact, the crash of 1929 created huge animus against the Hoover Administration. (1) The anti-Prohibition stance of Democrats in big cities was no longer such a negative. City voters were growing fast and so was the evidence of gangsterism created by Prohibition. (2) FDR was not a Catholic. However, FDR had two new - big - problems in the run-up to the Democratic convention in Chicago at the end of June 1932. In addition to his decade-long struggle with leg paralysis caused by his 1921 bout with polio, FDR was burdened with a huge debt from the Warm Springs, Ga., foundation that he created while there for rehabilitation. Democrats in the west and south opposed the nomination of another New Yorker, after two losses by Al Smith in the general election. Will Woodin was to play a big role in addressing the first problem and a significant role in addressing the second. During 1926-28, before he was elected Governor of New York, FDR spent half his time in Warm Springs. While regaining his health, he came to dream of sharing the restorative powers of the hot springs. In 1926 he committed about $200,000, two-thirds of his liquid assets, to buy from George Foster Peabody the old Merriwether Hotel in Warm Springs to house a new rehabilitation center. He ended up buying nearly 3,000 acres. After his reelection as Governor in 1930, FDR's circle of supporters turned their minds to the possibility of his running as President and the Warm Springs charity loomed as a giant albatross. It wasn't just that FDR had ran through his bank account buying the hotel and land and then renovating the properties. The center itself was operating at a significant annual deficit because FDR arbitrarily set a weekly rate for treatment of $42, which was below his costs. On top of that he accepted patients regardless of their ability to pay. The cumulative debt in 1930 was more than the Roosevelt family could handle and precluded FDR from undertaking the expense of a campaign for the Democratic nomination and then a national campaign for the presidency. 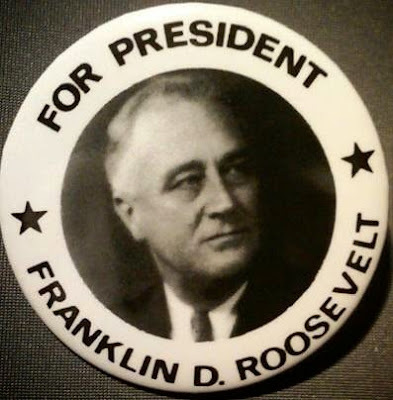 Until this matter was settled, FDR could simply not take on running for prresident. At this juncture, Will Woodin stepped in, urged on by John J. Raskob, Chairman of the National Democratic Committee. Raskob was a businessman like Woodin. He was Vice President of both General Motors and DuPont, and champion of the idea that "Everyone Ought to Be Rich". He was prepared to put up money to support FDR's run for Governor, but not to raise money to pay off the debt. Woodin agreed to chair the Finance Committee of the Warm Springs Board and raise money to pay off the debts. He got a commitment first from Raskob that was fulfilled. He then chipped in a substantial amount himself and went raising money by launching a public relations program pointing out the devastation caused by polio, and urging support of preventive action and rehabilitation. It worked. Woodin's taking onto himself the burdens of the Warm Springs finances was a significant contribution - understood by everyone who knew about the situation - to FDR's willingness to run and his electability. With the Warm Springs debt addressed, FDR hastened to position himself as the champion of Main Street and the ordinary working person against Wall Street. The financial crisis caused a sea change in American electoral politics. From being viewed as the engine of the economy and the creator of wealth, Wall Street had now become a pariah. FDR was intently focused on making sure (1) the blame fell on Hoover, (2) there was a plan to fix the problem, and (3) there was a person he could put in Treasury who could take care of this while he focused on delivering the overall message. The shift in national psychology from 1928 to 1932 was astonishing. The turnaround in the election returns has never been equalled. The Democrats went to their convention looking for a candidate who could make full use of the opportunity that economic misery offered to them. They succeeded in finding the right person. Treasury Secretary Andrew W. ("Andy") Mellon was too good a target not to include in the assault that the Democrats prepared on the Republicans in 1932. In addition, FDR came to have an intense personal dislike for Mellon. Wall Street gave the signal / And the country went to hell. In the Senate, outgoing Republican Chairman of the Banking Committee, Sen. Peter Norbeck (S.C.), found New Yorker Ferdinand Pecora to become the General Counsel to the Committee to investigate the 1929 collapse. This is the man who was called "The Hound of Wall Street." In the House, Republican Chairman of the Banking Committee, Rep. Louis Thomas McFadden (Pa.), moved to impeach Hoover in 1932 and thereby induced Mellon to resign within days. The Pecora Committee. The Committee that was created by Senate Resolution 84, introduced March 2, 1932, authorized the Committee on Banking and Currency to investigate “practices with respect to the buying and selling and the borrowing and lending” of securities. During the first 11 months of its work, the Committee got little done as banking executives refused to produce bank records and evaded questions. In early 1933, at his wits end because of the stalling of banks and securities firms, Committee Chair Sen. Norbeck made what he called a "happy discovery" and hired a new chief counsel, former New York deputy district attorney Ferdinand Pecora. Pecora ensured he would be kept on by the Democrats by going right to work using the Committee's subpoena power and the glare of publicity. The results were swift and momentous, and they reached unexpected places. The Impeachment Resolution. Meanwhile, in early 1932 Republican Rep. McFadden was creating havoc in the House. Born in Bradford County, Pa., he graduated from a commercial college in Elmira, N.Y. and worked his way up to be president of the First National Bank in Canton, Pa. In 1914, McFadden was elected from Pa. to the 64th Congress and he was reelected to the nine succeeding Congresses, chairing the House Committee on Banking and Currency from 1920 to 1931. His main banking legacy was passing the McFadden Act of 1927, limiting federal branch banks to the city in which the main branch operates. McFadden was a sworn enemy of the Federal Reserve, which was run, he said, by Jewish banking interests who controlled the USA and deliberately caused the Great Depression. The GOP was in a corner nationally. Even within the GOP, Hoover was isolated. A joke told at the time was that Hoover asked Mellon's replacement as Treasury Secretary, Ogden Mills, to lend him a nickel to buy a soda for a friend. Mills is said to have replied laconically: "Here's a dime. Treat all of them." To be fair, Hoover was hamstrung by the small-government orientation of his party in the face of a huge crisis. He had experimented with some public-works initiatives, but they were too isolated and tentative to have much impact on the economy. The Republican convention in Chicago in mid-June 1932 had a six-point economic program. Point 3 was: "To stand steadfastly by the principle of a balanced budget." Point 4 was: "To devote ourselves fearlessly and unremittingly to the task of eliminating abuses and extravagance and of drastically cutting the cost of government so as to reduce the heavy burden of taxation." In short, the GOP was committed to cutting spending despite a 25 percent unemployment rate, which has to be viewed with hindsight as a strategic error as well as a humanitarian failure. Hoover’s claim to credit for a large public-works program is wholly false. Public works have greatly contracted during the depression. He has fought every measure which really would have led to a net expansion. If he had wanted at all costs to aid the unfortunate and increase prices, he would have enlarged governmental expenditures and would have borrowed the money with which to do so. Thus he would have risked further depreciation of bond prices and injured the creditor class. What he really did was to try to save the capitalist system by saving the creditors at the expense of the population at large, letting the devil take the hindmost. To balance our budget in 1933 or 1934 or 1935 would have been a crime against the American people. ... [W]e should have had to set our face against human suffering with callous indifference. [I]n the first stage of the technique of recovery I lay overwhelming emphasis on the increase of national purchasing power resulting from governmental expenditure which is financed by loans and not by taxing present incomes. The two leading candidates at the Democratic convention were FDR and former NY Governor Al Smith. FDR's staff spoke privately to the next-leading candidate, John Nance "Cactus Jack" Garner, Speaker of the House, offering him the Vice Presidency in return for his support of FDR; he agreed. At the next ballot, FDR won the nomination. It was a terrible year to raise money for FDR's campaign. The Democrats had a considerable deficit when the election rolled around. Frank Walker, treasurer of the Democratic National Committee, did the best he could. The DNC spent about $2.2 million, or $500,000 less than the Republicans. FDR's top two supporters (both contributing money and asking others for money) were John J. Raskob, banker and automobile manufacturer (GM), who served as Chairman of the DNC, and Will Woodin. Other major donors were Bernard Baruch, financier; Vincent Astor, Chase National Bank; William Randolph Hearst, newspaper publisher; R. W. Morrison, of San Antonio, Texas; M. L. Benedum, Pittsburgh oil and gas operator. The anti-Wall Street mood in the country produced the numbers that FDR hoped for. In the general election in November, the election returns turned the 1928 numbers upside down. The victory this time went Democratic, with FDR capturing 57.4 per cent of the votes to Hoover's 39.7 percent; the electoral college split 472-59. In Suffolk County, N.Y, where Woodin had a summer home since 1912, Hoover beat FDR, by fewer than 10,000 votes - a sharp drop from 1928 when Hoover carried the county by more than 21,000 votes. Nationally, the GOP was ahead by 50 in 1928 on the Real Clear Politics index of party support at the polls. Most of the time, 60 percent, the index varies between plus and minus 30 points. By 1936, the GOP score dropped down to -119, a plunge of 169 index points. This is the largest shift in the electoral winds on the RCP chart covering 1928-2012. Hoover believed he was a wholly innocent man pursued by fate. But the origins of the Crash of 1929 were interwoven with his own past. He led the country up the mountain of unbridled capitalism and to the brink of the precipice, and he took credit for the ascent. … [H]is defense of “sound money” [and] balancing the budget was a bankers’ policy, pursued in the interest of financial institutions—our great creditors. … It is either disingenuous or stupid to represent this course as being in the immediate interest of debtors, farmers, and the unemployed. On the contrary, it shifts to them a major part of the losses of the [D]epression. [T]he rigid economy necessary to produce a balanced budget limits governmental expenditures at the very time when it is most necessary to expand them as a means of unemployment relief. [D]irect aid to debtors and a really adequate program of public works … may create employment [and] put money in circulation. “Traitor to his class” Roosevelt tempered his objectives with the spirit of compromise. Friends and enemies alike had to admit that FDR was a political genius. During the interim between November and March, Hoover wanted FDR to sign on to every significant move he considered making. FDR refused to take on his responsibilities prematurely. The Depression changed public opinion about Hoover's understanding of the economy and his ability to fix things. Voters were disappointed in Hoover. FDR's actions in New York State showed that more could be done for the economy than Hoover was willing to do. It is interesting to speculate what might have happened if Andrew Mellon had not been so exasperated with attempts by Rep. McFadden and Wright Patman and other to impeach him starting in January 1932 and had stayed on. I speculate that a likely outcome is that President Hoover might have taken some of the actions that FDR and Woodin took a year after Mellon resigned. Under the 1913 Federal Reserve Act, the Treasury Secretary was also ex officio chairman of the Federal Reserve Board (later, the law was changed to provide for an independent Chairman). Mills was therefore at the top of the two institutions that were supposed to be addressing bank panics. Mills was a competent lawyer but was part of a system that was not equipped to address the problems it faced. Born in 1884 in tony Newport, R.I., Mills graduated from Harvard College in 1904 and Harvard Law School in 1907. He was a loyal delegate to the Republican National Conventions of 1912, 1916, and 1920, having won election to the New York state senate in 1914. He resigned in 1917 to enlist in the US Army and was discharged with the rank of captain. Starting in 1921, Mills won three successive elections to the US House of Representatives. In 1926, he ran on the GOP ticket against incumbent Al Smith for Governor of New York and was defeated. In 1927, President Calvin Coolidge appointed Mills undersecretary of the Treasury, where he served under Andrew Mellon. Since Mellon spent much of his time in Europe, President Hoover came to rely heavily on Mills, who was faithful to the GOP Hard Money cause. This background meant that in the midst of the financial panic and high levels of unemployment, Mills kept calm and called for a balanced Federal budget. As more banks closed and workers became unemployed, tax revenues fell, so a balanced budget meant swift deep cuts in government spending and higher tax rates. After his retirement from the Treasury, Mills attacked FDR's policies in several books that did nothing to stop FDR's massively one-sided reelection in 1936. Mills died the following year in New York City. The cabinet short list as of December 9 included Senator Carter Glass or Bernard Baruch as Treasury Secretary. Will Woodin was listed as a probable Commerce Secretary - the job that Hoover had filled. Biographies of Carter Glass say he was offered the job of Treasury Secretary and turned it down. A widely reported AP story on February 21, 1933 reports just that. But a frequently cited tale suggests that FDR was still wondering whether Glass or Woodin would be a better choice. Some advisers to FDR urged him to keep Glass in the Senate where his seniority was important. Either FDR's staff made their recommendation or Glass took himself out, but in the end a message went to FDR from his staff saying that "a wooden frame for the swimming pool is preferred to a glass one" (the Warm Springs center had under way a glass-enclosed swimming pool). Woodin was offered the job. He had already been working closely with FDR in February. He was perfect for the position – a Republican, a Main Street business executive of prominence, a friend of FDR – someone who could be trusted with the huge job of making sure that FDR's remedies for the financial disaster and the bank panics would work. He was not from the banks or Wall Street, but he knew them and vice versa, all the better to take them on. Another person who would be on FDR's team was Joe Kennedy, who Kennedy graduated from Harvard in 1912 announcing a plan to earn a million dollars by 32. Within 20 years, he headed a bank that he rescued, managed a major Boston shipyard, and helped facilitate the merger of RKO, salvaging the U.S. film industry. He was known as a bloodless investor. But FDR is his match. When FDR was Assistant Secretary of the Navy in 1917, Kennedy refused to release ships his private shipyard had built until the government had paid for them. 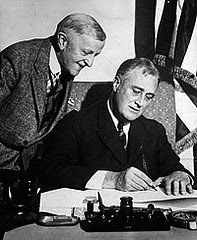 FDR sent in the Marines, earning Kennedy’s respect and, in 1932, his support – and brought with him William Randolph Hearst. In the meantime, Hoover was as panicked as the banking system he was supposed to calm. He begged FDR to join with him in supporting certain measures that would stem the panic. Ogden Mills could not bring himself to deviate from the balanced-budget orthodoxy, and after the election in 1932 he was no more eager or willing than Hoover to take strong action. However, FDR was become by this time a consummate politician and was not going to dilute the impact of his presidency by allowing Hoover to take his share of credit for any employment-creating or panic-reducing measures that might be introduced during the months before Inauguration. In the immortal words of a later era, FDR let Hoover "twist slowly in the wind" while instructing Woodin and other members of the Cabinet to be ready to take action on the day FDR took charge. Harding was weak and had a strong cabinet that included Herbert Hoover and Andrew Mellon. Hoover was strong and had a weak cabinet except for Andrew Mellon. FDR was a strong President but he had a broad agenda, so he needed strong, detail-oriented managers in his Cabinet, and Will Woodin exactly filled the bill. It was a good match in many ways. Unfortunately, powerful forces unleashed to solve one big problem may create other ones. That is a story for the next chapter. 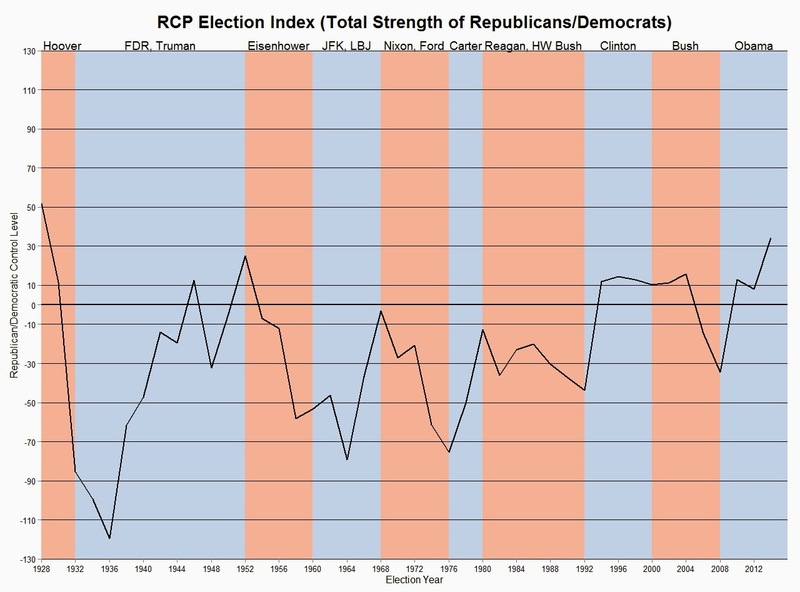 Data on GOP Strength 1928-2016: Real Clear Politics Blog http://bit.ly/1SkadCq. Warm Springs Purchase, 1926: Jean Edward Smith, FDR, New York: Random House, 2007, pp. 208-217. Raskob: "Everyone Ought to Be Rich," Ladies Home Journal, August 1929. Balanced Budget: FDR Library, http://www.fdrlibrary.marist.edu/aboutfdr/budget.html. 1924 and 1928 Conventions: FDR Library. 1928 Election: Paul F. Boller, Jr., Presidential Campaigns (Oxford University Press, 1996). 1932 Convention: Paul F. Boller, Jr., Presidential Campaigns. 1932 Votes: Paul F. Boller, Jr., Presidential Campaigns. Suffolk County: “Normal Rep. Vote Cut Heavily," East Hampton Star, Nov. 11, 1932, p.1. Ogden Mills: Abbreviated from the The Federal Reserve History Gateway bio of Ogden Mills. Cabinet: “Washington Inside and Out," East Hampton Star, Dec. 9, 1932. May 21, 2015–The stakes of the 2016 election are made clear in a Real Clear Politics chart by Sean Trende and David Byler. It shows changes in party strength based on Federal and state elections–weighting equally the presidency, Senate, House, state governors and state legislatures. Will GOP Grow in 2016? The RCP blogpost on Tuesday extends the chart to offer three different scenarios for the outcome of the 2016 Federal elections - win, lose and draw. Their conclusion is that the 2016 election is important. Voters tend to move away from the party of the presidency. 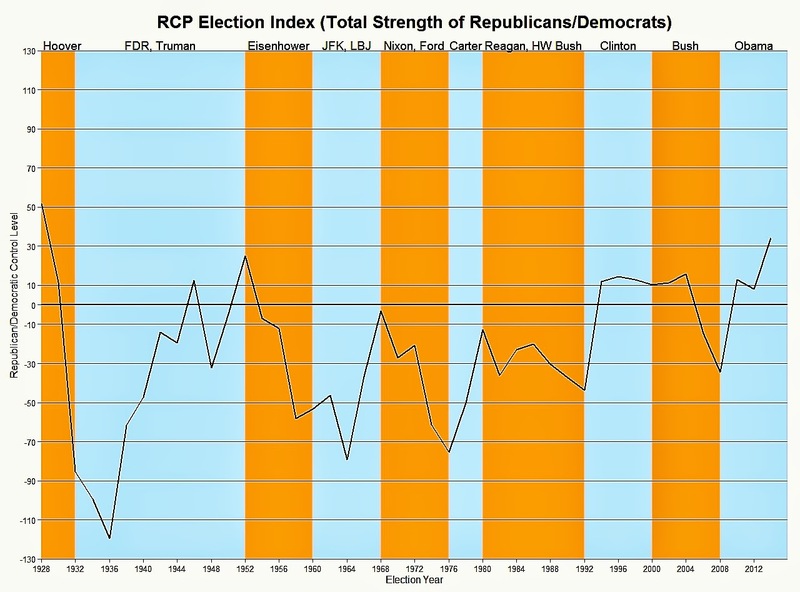 After 1936, the GOP steadily improved its electoral position, with a slight blip in 1944. Only three incumbent Presidents widened their party's lead by much: FDR in 1936, Truman in 1948 and LBJ in 1964. All were Democrats and they widened their lead by being decisive in a crisis. When half-hearted policies don't work, it could be because they were inadequate. Political fortunes can change quickly if perceptions are altered by events. Voters were disappointed in six GOP presidents: Hoover, Eisenhower, Nixon, Ford, GHW Bush, GW Bush. Reagan and Clinton (despite his impeachment) held their own after the first mid-term. Voters are fickle, but they care about the economy. Since I am writing about the financial crisis of 1929-33 and FDR's first Treasury Secretary, one of the three Republicans in FDR's first cabinet (the other two were Ickes and Wallace), my focus is on the early years of the chart, especially what happened between 1928 - the first election year shown - and 1936. The peak score of 50 in 1928 dropped down to -119 in 1936–a plunge of 169 index points. This is the largest shift in the electoral winds on the chart. Most of the time (60 percent of the time) the index varies between plus and minus 30 percent. Why did that huge shift between 1928 to 1932 happen and what lessons does this shift offer for today? I am using as my guide Paul F. Boller, Jr.'s Presidential Campaigns (Oxford University Press, 1996). Let's start at 1912, when Woodrow Wilson won the presidency because the Republicans were divided between Republican Taft and Bull Moose party leader Teddy Roosevelt. All three candidates were competing for progressive voters. Four years later, the country had shifted to the right and the race was about who could keep the country out of war (it took only till April 2 before Wilson had asked "the Gentlemen of Congress" to declare war). By 1920 the country had moved further to the right, fearful of the Russian Revolution and the League of Nations. Even though Wilson was not on the ballot, the vote was largely against him. The Republicans were confident of winning - and, sure enough, Warren Harding won 60.2 percent of the popular votes against James M Cox; 404 electoral votes to 127. Harding died of a heart attack in office, and Vice President Calvin Coolidge took the reins. Coolidge ran in 1924 against a Democratic Party that was divided between Eastern voters who were "wet" and Western and Southern voters who were "dry". After a marathon of balloting, the two sides compromised on Wall Street lawyer John W. Davis to oppose Coolidge, who was a shoo-in with 54 percent of the votes. And the country went to hell. Mellon resigned in early 1932 as Hoover was impeached. Hoover asked his end-of-term Treasury Secretary, Ogden Mills, to lend him a nickel to buy a soda for a friend, and Mills replied laconically: "Here's a dime. Treat all of them." What had happened, of course, was the Crash of 1929 and the beginning of the Great Depression. To be fair, Hoover experimented with some public-works initiatives, but they didn't turn the economy around. A clueless Republican convention called for a balanced budget, requiring cuts or tax increases - as did the Democratic convention that followed. (FDR embraced the plan but wisely decided later to ignore it to bring down unemployment). The two leading candidates at the Democratic convention were FDR and former NY Governor Al Smith. FDR's staff spoke privately to the next-leading candidate, John Nance Garner, Speaker of the House, offering him the Vice Presidency in return for his support of FDR; he agreed. FDR was nominated and won with 57.4 per cent of the votes to Hoover's 39.7 percent, with the electoral college splitting 472-59. Here is a larger version of the chart to help in reading the headings. 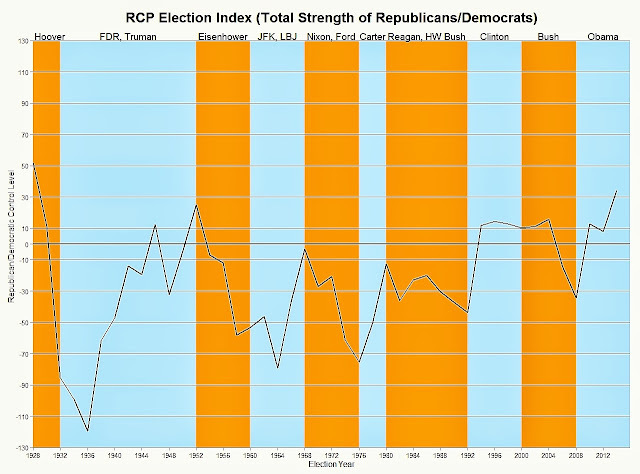 Changes in GOP Electoral Strength, 1928-2012, Chart by Sean Trende and David Byler, Real Clear Politics. 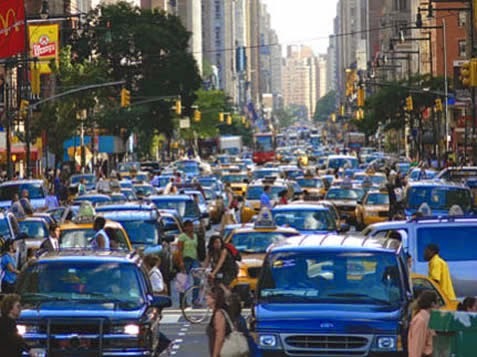 TECH WARS | Is Über Creating More Congestion in NYC? to pollution, lowers the quality of life, depresses retail sales and the economy. Will anyone pay enough attention before we have a Godzilla of Gridlock? Über may force another look at the toll-free status of four bridges across the East River. Traffic congestion is a costly problem for New York City residents, workers and visitors. An aspect of the Tragedy of the Commons, scarce public goods like roadways in dense cities run the risk of overuse without restrictions or pricing. New York City has a sophisticated traffic control system to ensure that the main arteries are flowing freely. In Manhattan, that's north-south. Traffic lights in Manhattan can be shortened, through a central control system, to restrict traffic in the east-west direction. However, some arteries are east-west - for example around the entrances to the bridges and tunnels. I have been noticing that in high-traffic periods, the east-west traffic heading for the West Side Highway or the Lincoln Tunnel is backing up onto the avenues (I see it on Ninth Avenue), creating gridlock. Is congestion getting worse? That's my perception, despite huge resources invested in traffic police and traffic-light technology. Could Über be adding to the problem? Something like Über was inevitable, putting passengers and drivers directly in touch. It puts to use private vehicles at peak periods to supplement NYC's yellow and green taxis and on-call limos. BUT the result is more use of the public roads, more congestion. Like the frog in the saucepan pan with the heat slowly rising, we don't notice what is happening until a crisis occurs - the frog is boiled to death, or (equivalently) we have a mile-long gridlock in Manhattan that takes hours to clear up. Former Mayor Bloomberg tried to get congestion pricing introduced in 2007-08. A broad approach to traffic pricing and mitigation is provided in the 12 principles of the late Columbia University Professor William Vickrey. I posted them at http://tinyurl.com/29vz7n. Singapore and London have introduced congestion pricing that seems to work. The term I'd borrow from my father is that we have a cockamamie system of charging people that makes absolutely no sense, and in fact encourages people to drive through our densest part of the city: Manhattan. This coming Friday millions of workers are going to be heading out to their Memorial Day Weekend vacation at the same time. Many cars come out of garages and parking lots for the long weekend excursions. This is the first of the three biggest weekends of the summer. It could be a test of the existing system. We think of the copyright law as a blessed compromise between the need of the public for access to literature and the need of writers for revenue. But David Post, via the Volokh Conspiracy on the Washington Post blogsite, today reminded us that the copyright law has been used to suppress speech. 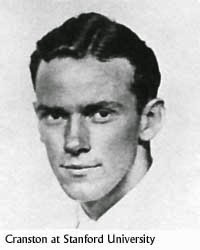 In 1938, Alan Cranston (1914-2000) - then a correspondent for the INS just two years out of Stanford, later to serve with distinction in the U.S. Senate - violated the copyright of a world-famous person in the public interest. The person whose rights were violated - according to a U.S. court decision - was Adolf Hitler and the book was an English translation of Mein Kampf. 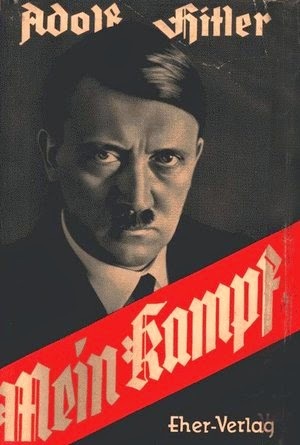 I read Adolf Hitler’s Mein Kampf, the book he wrote while he was in prison before he became the dictator, outlining his plans for Germany and the terrible things he intended to do in the world. There was no English language version of it. [O]ne day in Macy’s bookstore in New York I saw a display of Mein Kampf, an English language version, which I’d never seen before, which hadn’t existed. I went over to look at it out of curiosity and as I picked it up, I knew it wasn’t the real book. It was much thinner than the long book that I had read, which is about 350,000 words. So I bought it to see how come. And delving into it I found that it was a condensed version, and some of the things that would most upset Americans just weren’t there as they were in the version I had read, the original, in German. So I talked to an editor friend of mine in New York, a Hearst editor named Amster Spiro, and suggested that I write and we publish an anti-Nazi version of Mein Kampf that would be the real book and would awaken Americans to the peril Hitler posed for us and the rest of the world. So we did that. I spent eight days [compiling] my version of Mein Kampf from the English language version that I now had, the original German language version, and another copy that had just appeared. David Post adds that Hitler won his copyright case in the U.S. District Court, Second Circuit. His German publisher, Eher-Verlag of Munich, and the US publisher to which it had assigned the US copyright, Houghton Mifflin, persuaded the court to enjoin further publication of Cranston’s version in the United States and to order destruction of existing copies. Houghton Mifflin v. Stackpole, 104 F.2d 306 (2d Cir., June 9, 1939). Hitler got to continue to receive royalties, and to control publication of his book, 10 weeks before he marched into Poland. Cameron claimed that austerity policies were driven by necessity, whereas Ed Miliband argued that it was ideological. Economists will continue to thrash out the issue; meanwhile, the public has chosen whom to believe. What’s Next for the United Kingdom? For a democratic union of two countries to survive, it needs majority support in both. This condition is still being met by Scotland and England, but only just. Who would be a good speaker on this for Oxford Alums? Recommendations so far are Piers Morgan (did not attend Oxford) or Stephen Fisher (Fellow, Politics Tutor at Trinity College Oxford, has been in BBC TV on the elections), Ian Williams, journalist at U.N. Behind the Numbers Unveiled Today. Ta-da. The curtain rose this morning on job numbers, +233,000 in April on U.S. nonfarm payrolls from March, seasonally adjusted. 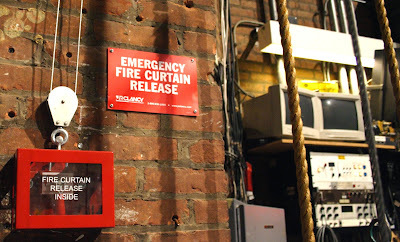 But watch out for the backstage revisions. The change in total nonfarm payroll employment for February could be described as "essentially unchanged", shading up slightly to +266,000 from +264,000. However, the change for March was lowered by nearly one-third, to +85,000 jobs from +126,000 jobs. This is well below last year's average of +260,000 per month. The details of the payroll-job numbers repay study for industry trends. The construction industry, even seasonally adjusted, showed strength in April at a healthy pace, growing by 45,000 jobs. But the growth is primarily in specialty contract jobs. Another barrier for workers without the specialty skills. Mining support firms, oil and gas drillers, showed declines for the fourth month, suggesting a cooling of the fracking frenzy. The mining industry has lost 49,000 jobs since the beginning of the year, mostly in support functions. Secretary Woodin and FDR, 1933. The Pecora Committee did great work bringing public opinion on the side of reform of the financial markets. The Glass-Steagall Act and the Securities and Exchange Act would not have passed so easily in 1933 were it not for Ferdinand Pecora's work in bringing forth revelations of the kinds of activities that created the Crash of 1929. Unfortunately, the Pecora Committee created collateral damage. In early May there was an enthusiastic endorsement of Treasury Secretary Woodin's work in calming the bank panics in the cover story on him in Time Magazine in early May. But by the end of the month the Pecora Committee's revelations were in every newspaper in the nation. J. P. Morgan sold stocks below the market price in the late 1920s to people on his "Preferred List". Those people included Calvin Coolidge. They also included FDR's own Treasury Secretary, Will Woodin. He already faced a chorus of intense criticism from the right, as fellow Republicans attacked him for joining the administration of a "traitor to his class," FDR. He now faced acute criticism from the left, as Democrats pilloried him for enriching himself at the hands of J. P. Morgan through special opportunities via Morgan's Preferred List. To his great credit, FDR stood by his friend Woodin solidly throughout this period. So did FDR's cabinet. However, FDR's Vice President, former speaker John Nance "Cactus Jack" Garner, urged Woodin to resign. At the FDR Library in Hyde Park, N.Y., I found what appear to be the last letters between Will Woodin and FDR, in 1934. By this time Will Woodin had left office. Dean Acheson would have been his natural successor, but - as I understand the dynamics - he resisted too vigorously FDR's going off the gold standard. Instead, Henry Morgenthau was selected, as a safe Treasury Secretary. FDR wanted Treasury to be more powerful than the Federal Reserve System, but not more powerful than the White House. Note that Woodin addresses FDR as "Governor"- their little joke, since Woodin worked for FDR when he was Governor of New York and the appellation brought back those days. Sometimes Woodin called FDR "Frank". Woodin was always addressed by FDR as "Will" and so signs himself. Everything seems to be going wonderfully thru out the country and I don't see how the Congress can stop you. I don't see how you do it. Will write again soon. He says how much his friends miss him - the Cabinet and the "old crowd" - i.e., I take it, the people in New York State who got FDR elected. FDR then moves on to the "banking bill". This bill was enacted within ten days, as the Gold Reserve Act. It made it a criminal offense for a private citizen to own gold. All gold is owned by the U.S. Treasury, except for businesses that need it for industrial or dental uses, or collectors of rare coins. The Act devalues the dollar. The value of gold is raised in dollar terms from $20.67 per troy ounce to $35 per troy ounce. The world value of the dollar as measured in gold was thereby cut nearly in half. All U.S. gold was entrusted to the U.S. Treasury, including gold and gold certificates in the hands of the Federal Reserve System. If that is how the law was perceived by the Fed, that was precisely FDR's intent. In the letter to Woodin, FDR says that the Fed sees itself as "a central bank", whereas FDR does not. He describes the Fed as an institution with "comparative decentralization" that is subject to "a strong Treasury Department". A supremely confident FDR shows a certain disdain at this time for the Congress that had distressed f him and Woodin in 1933. "Congress will pass the bill all right. The sooner the better." FDR was right on the mark this time, despite the revolutionary nature of the Gold Reserve Act. FDR was in the catbird seat and on the devaluation question I think history supports FDR's action as what was needed to spur the economy. February 27, 1934. Still recuperating in Tucson, Woodin writes to FDR again. Woodin has now given up talking about policy. The devaluation of gold is what his friends were all afraid of and he is probably happy not to be in the hot seat on that issue. He is focused on the risky surgical operations that are ahead of him. I really believe the sooner I have this thing cut out or burned out the better for me. The whole thing must come from the rt tonsil so out she goes. Woodin's descendants believe that he had a "strep throat" that would have been cleared up today by antibiotics. This letter suggests that "this thing" is not an infection, but a growth. Woodin has been invited to the dinner honoring the first anniversary of the inauguration, and is sad not to be able to attend. The second page is almost a farewell to FDR. I leave here with fond and grateful memories of all your kind messages - telephone and letters – they have cheered me up a lot. You are the most wonderful and understanding man that ever lived. Always Devotedly your Will. Woodin's farewell was prescient. He returned to New York City, was treated at the Eye and Ear Hospital and on May 3 was gone. The letters that then followed from FDR were to Nan Woodin and to friends of Will Woodin who wrote to FDR. There was a funeral service first at the Fifth Avenue Presbyterian Church. Woodin's coffin was then transported by train to a commercial stop at Hazleton, Pa. and it was then transported by car for a burial service in Berwick, Pa.
Charlie Miner says the cause of death would today be described as a strep throat, for which there was then no cure. However, Woodin had throat problems since he seas at college, and it might have been a cancer. Woodin’s body is brought to Hazelton, Pa. by special train and from there is carried by car to the First Presbyterian Church in Berwick. Many flags along the streets are flown at half-mast. Hundreds view the body as it lies in state for 90 minutes. At the funeral service on Sunday May 6, 1934, only half those lined outside the church can get in - first those who have tickets and then the rest up to capacity. The remainder stand outside. Before and after the service, Woodin's composition "The Unknown Soldier" is played by the organist Clark Fuller. There is no music during the 19-minute service, conducted by the Presbyterian pastor Rev. Dr. David M. Harrison. Methodist Rev. W. W. Sholl co-officiates with an introductory prayer. At the burial, "thousands" of people attend the four-minute committal service. His coffin is covered with daffodils and irises. Bill Selden remembers Will's funeral. Before my talk to the Berwick Historical Society at the Berwick Golf Club in April 2015, I received a note from him. He later received a surprise award at the luncheon for sponsoring one of the rooms in the Jackson mansion, i.e., the Billiard Room. Bill's note, which he has given me permission to publish, reports that he was born on March 25, 1921, so turned 94 last month. He grew up in the Borough of Staten Island, New York City until 1932, when he was 11 years old, so he was old enough to remember the first election of FDR. His father, William H. Selden Sr., migrated in the reverse direction from William Woodin, moving with his family to Berwick from New York in 1932. William Selden Sr. worked for ACF for 45 years, first at its NYC office on 30 Church Street starting in the early 1900s. 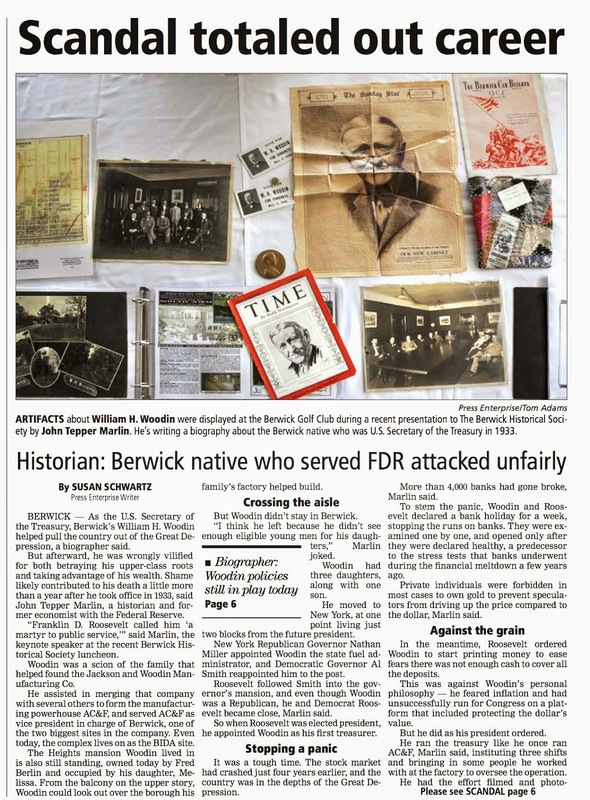 In 1932, the year of FDR's election, he was transferred to the Berwick office of ACF, where he had the title Assistant Mechanical Engineer in charge of Estimating, although he never attended college. 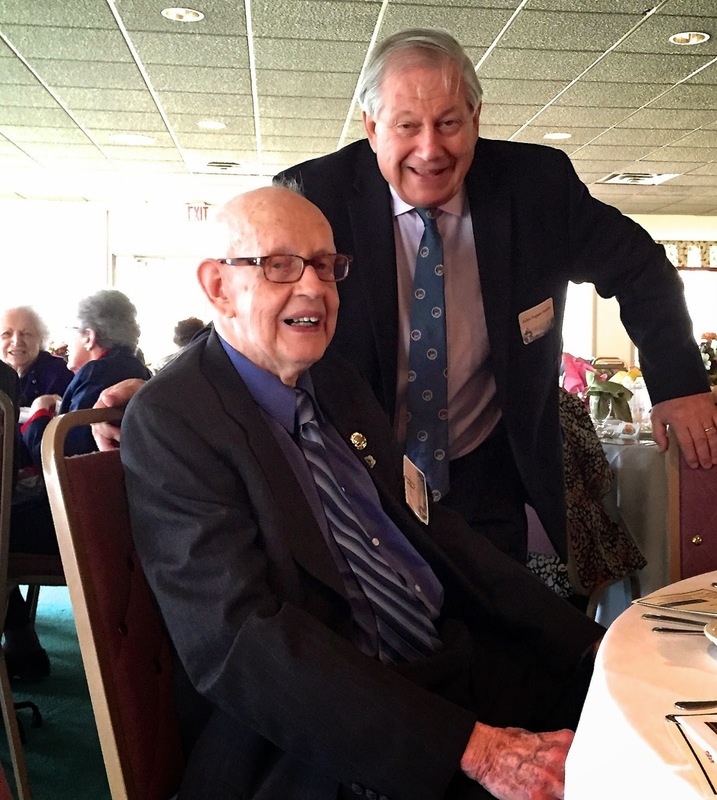 Selden Sr. said, according to his son Bill: "Mr. Woodin was a fine man and a very capable executive of ACF." Bill (Selden Jr.) meanwhile went to elementary school in Berwick and High School, then served in the U.S. Army during World War II. He was 24 on V-J day. He went on to earn a doctorate in education and was named to the Academic Hall of Fame in Berwick. His note provides the following memory of Will Woodin's death. I have added two parenthetical explanations to clarify that FDR did attend Woodin's prior funeral in New York City. I know from my personal knowledge of the great sacrifices he [Will Woodin] made for the nation during the trying times of last year when disregarding his health he toiled ceaselessly to bring security to his country and fellow citizens (Columbia University Digital Collections, Lehman, 0979_0006). Bill Selden Memories: Hand-written note to the author from Dr. Selden. 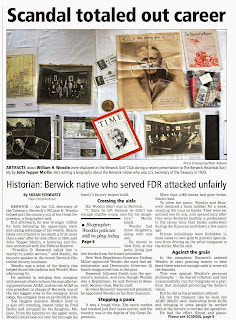 Berwick Service: Source for Berwick service and burial includes: East Hampton Star, May 10, 1934, 1, 8. FDR Library, Hyde Park, N.Y.